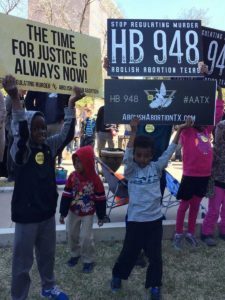 AUSTIN, Texas — Hundreds gathered at the Texas state capitol on Saturday to stand in support of a Texas bill that aims to abolish abortion in the state. As previously reported, Rep. Tony Tinderholt, R-Arlington, introduced the Abolition of Abortion in Texas Act last month that declares that unborn children are entitled to human rights from the moment of conception, and removes current exemptions under state criminal homicide law relating to abortion. “A living human child, from the moment of fertilization upon the fusion of a human spermatozoon with a human ovum is entitled to the same rights, powers, and privileges as are secured or granted by the laws of this state to any other human child,” H.B. 948 reads in part. According to a press release from Tinderholt’s office, “[t]he current protections allowing for life-saving procedures if a mother’s life is at risk due to pregnancy complications remain in place” under the proposed legislation. “When you read and see how abortions are performed, and how they end the life of an innocent child, it amazes me that we allow that,” Tinderholt, a Roman Catholic, told the Star-Telegram. He said that the bill is in response to language in the Texas Republican Party platform, which was passed in May, calling for the complete abolition of abortion in the state. Attendee Danielle Borgia told reporters that she drove from Fort Myers, Florida to participate. Joe Goodson, president of Concern Christian Citizens, helped organize a group to attend from the Temple area.